Yes!!! 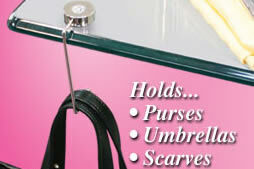 I have finally found the perfect gift for my mom–The Purse Hook! When I was a kid my mother carried a purse big enough for a 14-day trip to Istanbul. She carried everything in there– curling irons, pick axes, silverware, binkies, a photo array of school pictures from pre-school to high school graduation, a change of clothes for ALL three of us kids and a four course meal before the days ofLunchables. The Purse Hook makes the perfect gift for that special lady in your life for myriad reasons, not to mention the fear of someone snagging Grandma’s handbag at the Mickey D’s while she is enjoying the free coffee.